Crows have created an interesting place in culture and literature. They are the tricksters. They are wise. They transport the souls of the dead. If you ask Edgar Allan Poe, they’re a bit irritating and don’t do much to uplift your spirits, what with the repetitive “Nevermore” business. 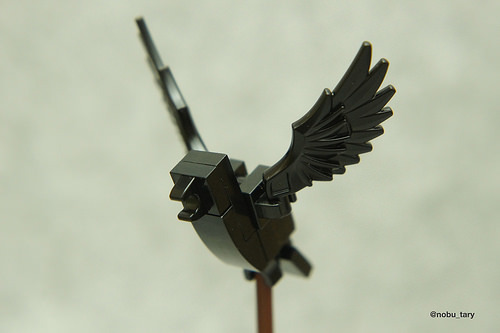 At any rate, nobu_tary has given us this excellent rendition, making great use of the wing piece we first saw in the Arkham Asylum set a couple years ago. They’re currently in the Chima sets as well.